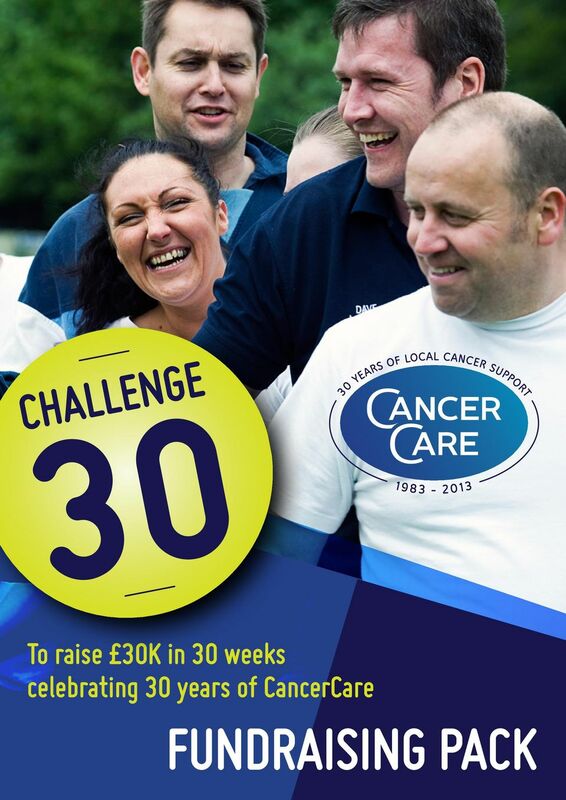 Download "To raise 30K in 30 weeks celebrating 30 years of CancerCare FUNDRAISING PACK"
2 HELLO! 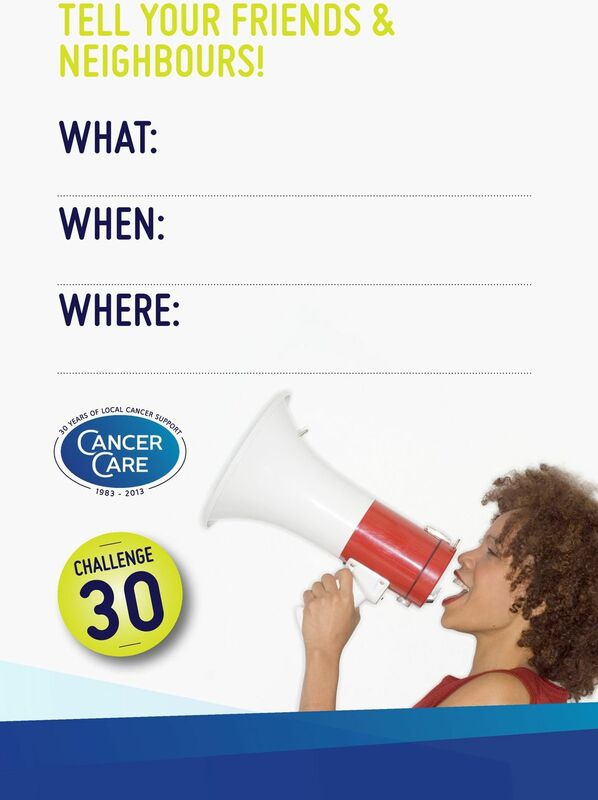 Welcome to your CancerCare Challenge 30 Fundraising guide. 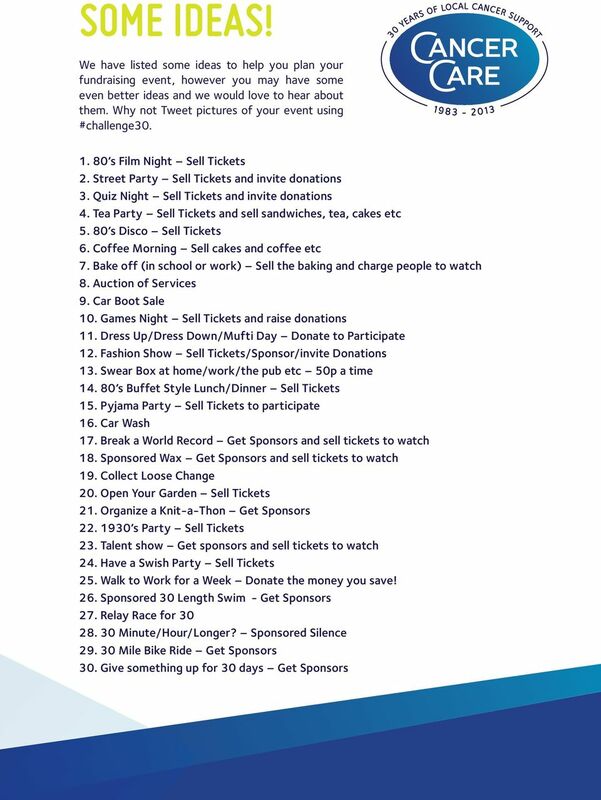 We hope that you like it and that it helps you to have fun whilst you help us to beat our target of raising 30,000 in 30 weeks. Why Challenge 30, why 30k and why 30 weeks? 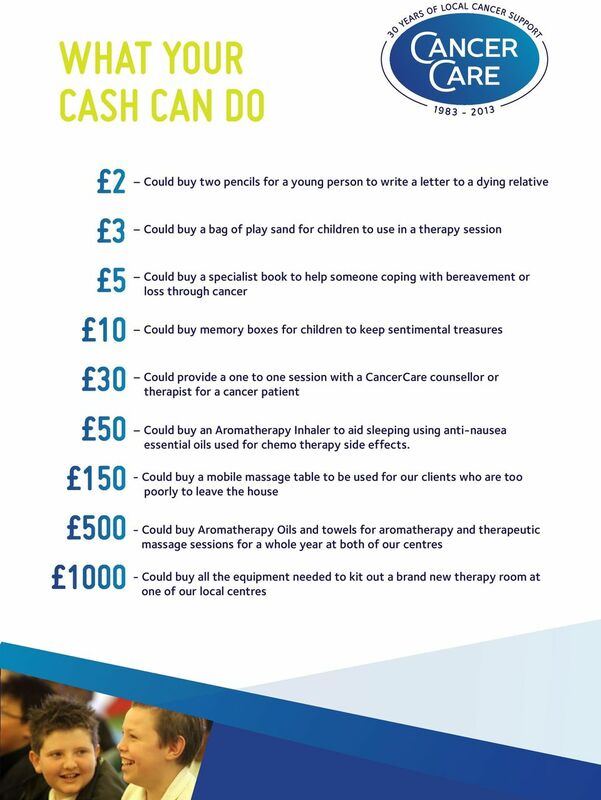 Well, CancerCare is thirty years old this year and during this time we have been providing support for local people affected by cancer throughout North Lancashire and South Lakeland; indeed, we may have even given support to someone you know. All of the work we do is made possible by the generosity of people like you, who either make donations or organise events to raise money for CancerCare. Without this help, quite simply CancerCare would not be able to continue with the work we do. So, if you are reading this as you consider helping us to smash our 30k in 30 weeks target, then we THANK YOU in advance for your support and we wish you a successful event and a fabulous time. 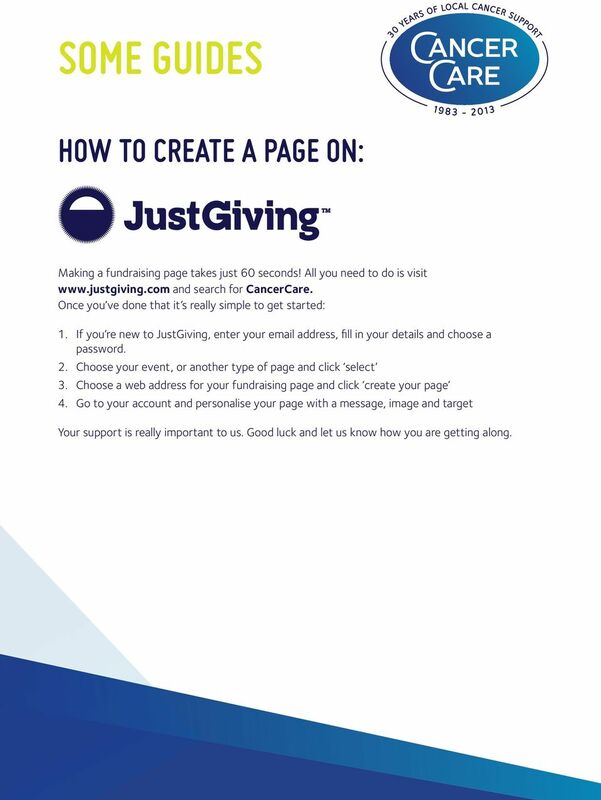 6 SOME GUIDES HOW TO Create a page on: Making a fundraising page takes just 60 seconds! All you need to do is visit and search for CancerCare. Once you ve done that it s really simple to get started: 1. If you re new to JustGiving, enter your address, fill in your details and choose a password. 2. Choose your event, or another type of page and click select 3. Choose a web address for your fundraising page and click create your page 4. Go to your account and personalise your page with a message, image and target Your support is really important to us. Good luck and let us know how you are getting along. 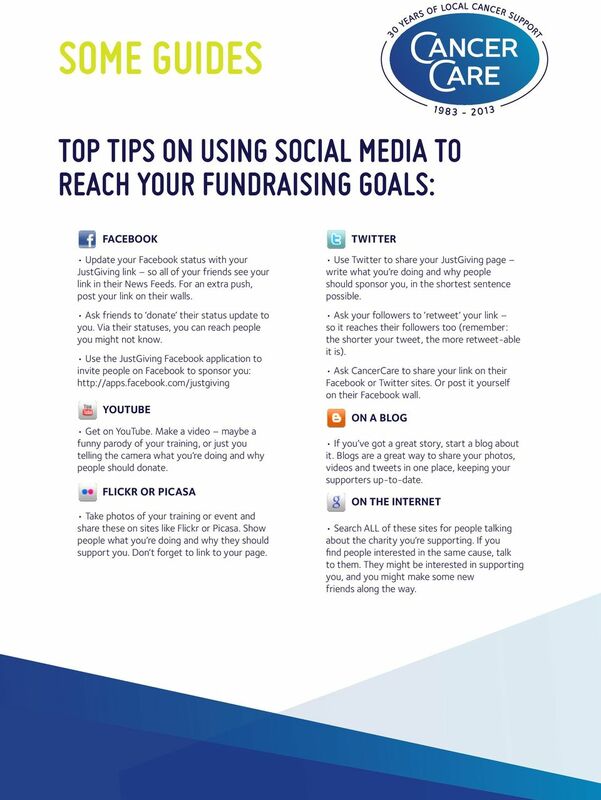 7 SOME GUIDES top tips on using social media to reach your fundraising goals: FACEBOOK Update your Facebook status with your JustGiving link so all of your friends see your link in their News Feeds. For an extra push, post your link on their walls. Ask friends to donate their status update to you. Via their statuses, you can reach people you might not know. Use the JustGiving Facebook application to invite people on Facebook to sponsor you: YOUTUBE Get on YouTube. Make a video maybe a funny parody of your training, or just you telling the camera what you re doing and why people should donate. FLICKR OR PICASA Take photos of your training or event and share these on sites like Flickr or Picasa. Show people what you re doing and why they should support you. Don t forget to link to your page. TWITTER Use Twitter to share your JustGiving page write what you re doing and why people should sponsor you, in the shortest sentence possible. Ask your followers to retweet your link so it reaches their followers too (remember: the shorter your tweet, the more retweet-able it is). Ask CancerCare to share your link on their Facebook or Twitter sites. Or post it yourself on their Facebook wall. ON A BLOG If you ve got a great story, start a blog about it. Blogs are a great way to share your photos, videos and tweets in one place, keeping your supporters up-to-date. ON THE INTERNET Search ALL of these sites for people talking about the charity you re supporting. If you find people interested in the same cause, talk to them. They might be interested in supporting you, and you might make some new friends along the way. It is fantastic that you ve decided to raise much needed funds for Heads On, Sussex Partnership NHS Foundation Trust s charity. Thank you! Fundraising pack. Staffordshire Wildlife Trust. About Staffordshire Wildlife Trust. Could you raise money for us? All day event Ask your local pub or riding club if they can arrange a 24-hour sponsored event. Fundraise for TREE AID & help plant hope across Africa. T. 0117 909 6363 E. W.
Fundraising pack. London New Forest. www.biggreenbikeride.co.uk biggreenbikeride@foe.co.uk 0800 581 051. Weekend and one-day options available. Thank you for choosing to raise funds for the Tuberous Sclerosis Association! Thank You. For choosing to fundraise for the children of our fallen heroes. Thank You For choosing to fundraise for the children of our fallen heroes. A message from nikki Thank you so much for choosing to fundraise for Scotty s Little Soldiers and the children of our fallen heroes. justgiving.com to make a meaningful commemoration by setting up a fund. You could ask your friends and family to give in lieu of flowers. Fundraising Guide. Have you got an exciting idea that will raise some money - well why not fundraise for Dogs Trust? Fundraising Guide. Together we are moving towards a day without brain tumors! Experience the ultimate adrenaline rush and take part in a sponsored skydive for Cancer Research Wales. Thank you. Contents. Key Fact. Your kidneys are amazing: they filter around 180 litres of blood every day! Thank you for choosing to fundraise for Threshold! Bridgebuilder Fundraising Toolkit. 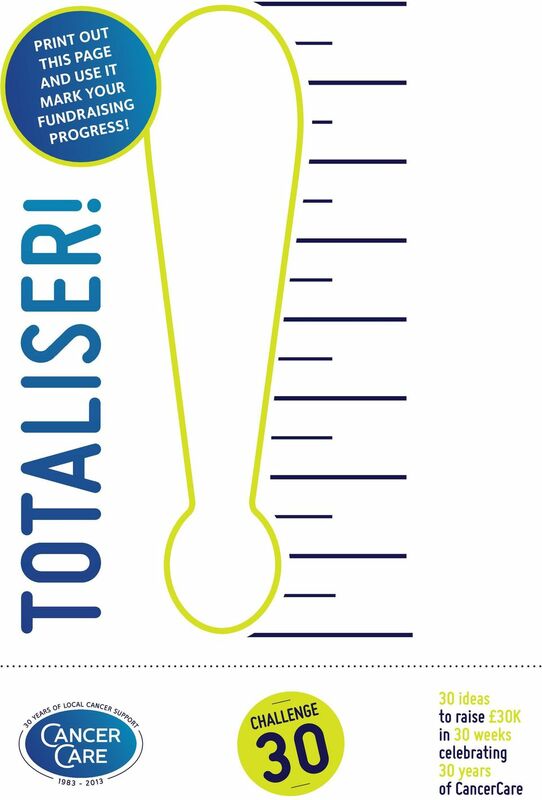 A complete fundraising pack to make it simple for you to raise funds on behalf of Bridgebuilder Trust. GIRLS NIGHT IN FOR CANCER RESEARCH UK. A night in with the girls is the new way to gang up on cancer. Families seeking to raise funds to pay for treatment can also access fundraising advice from the trustees of Headstart4Babies. 1 FUNDRAISING PACK www.carerstrust4all.org.uk 2 Welcome to Carers Trust 4 All. 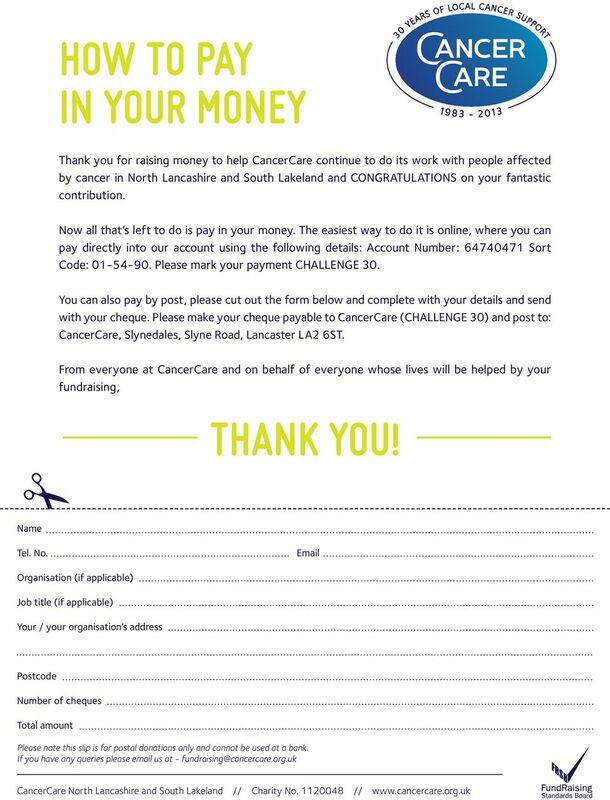 We are really happy that you are thinking of doing some fundraising for Carers and we want to help you in any way we are able. Fundraising Pack! Race Night Bake Garden Party! Collect! Vintage Tea Party Who we are Thank you for choosing to support Jessie May! Jessica May Purrington was born with a condition called Muscular Atrophy. What difference your donations will make. Welcome. Bill s story. Thank you again for your support. 4. Set up the books in a central area. It helps to arrange the books in rough age groups if there is more than one class participating. A Guide to Community Fundraising You can change the lives of refugees around the world! what could Our supporters have run, swum, climbed, sung, golfed and walked - not to mention danced and partied. In this pack we hope to give you all the fundraising tips and information you need to raise as much money as possible for CLIC Sargent.